Tyson Research Center is Washington University’s field station and home to several large-scale environmental biology research projects. At Tyson we do BIG science and need a lot of helping hands. Through the Tyson Environmental Research Fellowships (TERF) program, St. Louis area teens can work as paid members of research teams alongside university scientists, postdoctoral researchers, graduate students, and undergraduate students. Twelve TERFers will be working at Tyson during summer 2018. Our first group of six TERFers have arrived! Welcome aboard to Daniel, Anna, Sabreena, Kayla, Vlada, and Farhan! After a morning of orientation activities, the TERFers joined up with their Tyson teams and got busy with research support. 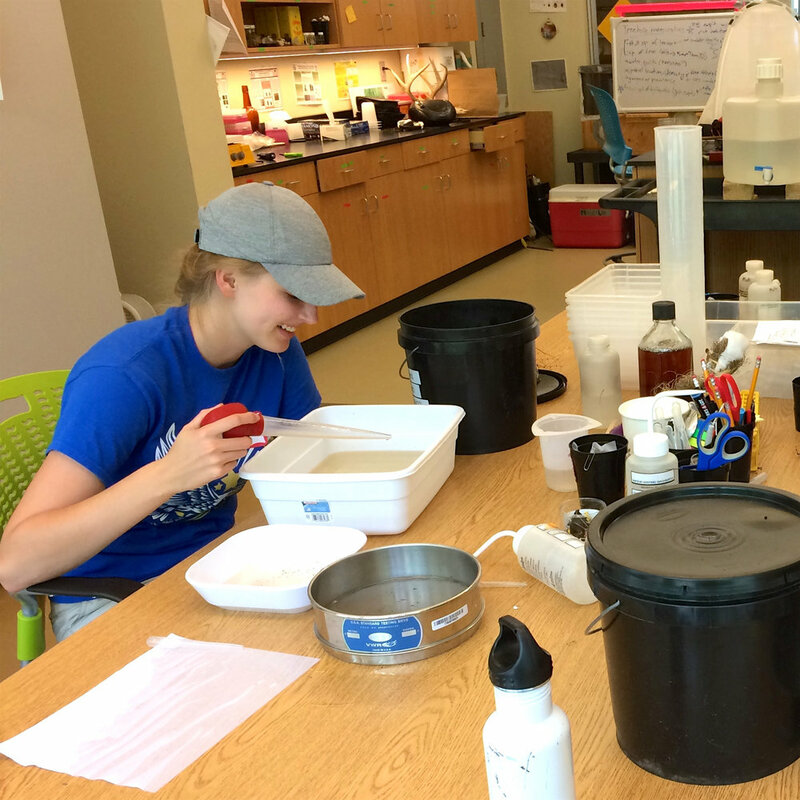 Anna (center) is sifting roots and rocks from prairie soil samples alongside WashU undergraduate students Rebecca (left) and Jacob (right). They are members of the Natural Enemies team working under the direction of Dr. Scott Mangan and Dr. Claudia Stein. Sabreena is a member of Team Tick-quito and will be studying mosquitoes in urban, suburban, and rural environments around St. Louis. She will be working closely with Dr. Katie Westby and Tyson Director Dr. Kim Medley to better understand the impacts of the invading Asian tiger mosquito. 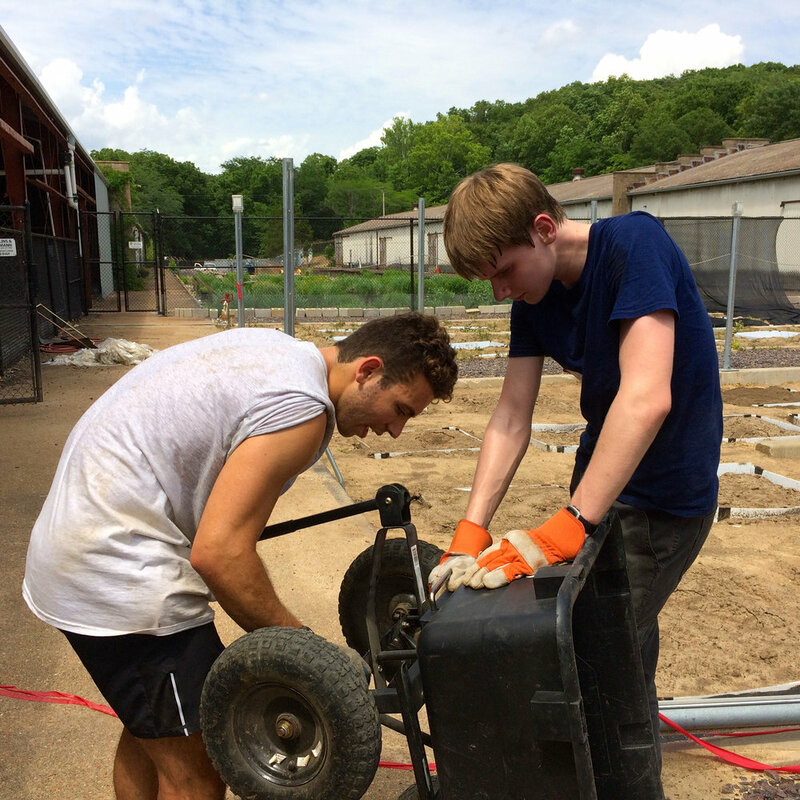 Daniel (right) is helping WashU undergraduate Ivan (left) repair the axle of a wheelbarrow so they can transport sterilized soil to the research garden. The Natural Enemies team is setting up a new experiment for WashU PhD candidate Rachel Becknell. Kayla is a member of the Tick & Wildlife Ecology Team and will be investigating the relationship between ticks and birds in the Tyson forest. She will be going out to capture birds early tomorrow morning with Dr. Solny Adalsteinsson and the rest of her team. 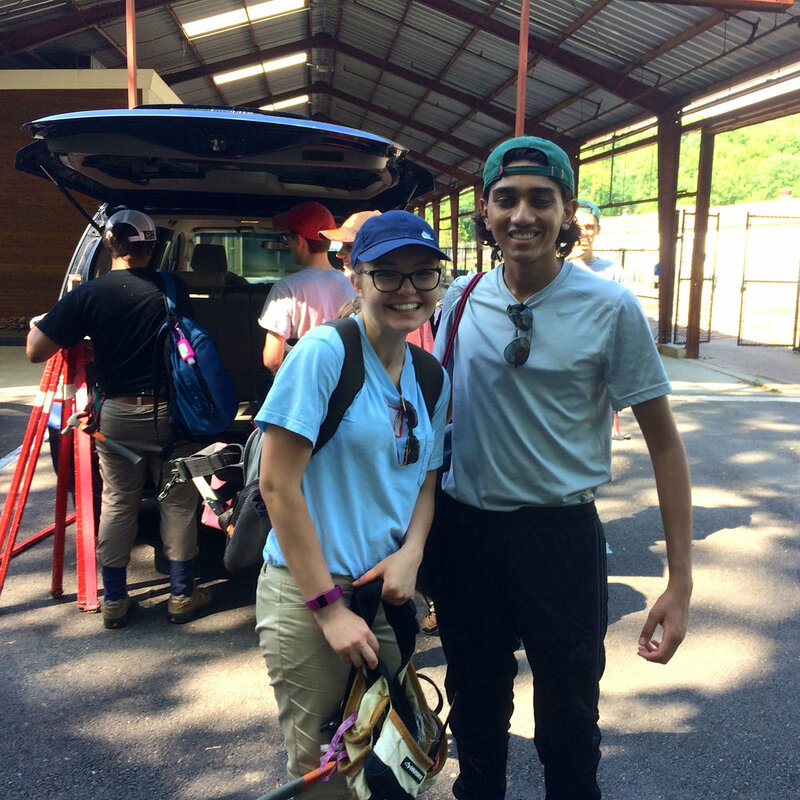 Vlada (left) and Farhan (right) survived a very hot afternoon in the woods learning how to measure and map trees with the Forest Biodiversity Team. This is the largest research team at Tyson with 2 TERFers, 8 undergrads, 3 technicians, 1 postdoctoral researcher, and principal investigator Dr. Jonathan Myers. A Day's Work: The TERFers have arrived! June TERFers pause for a photo at the highest elevation point at Tyson Research Center, one of the several places they had to find during the Tour de Tyson Challenge on their first day. Tyson Research Center is Washington University’s field station and home to several large-scale environmental biology research projects. At Tyson we do BIG science and need a lot of helping hands. Through the Tyson Environmental Research Fellowships (TERF) program, St. Louis area teens can work as paid members of research teams alongside university scientists, postdoctoral researchers, graduate students, and undergraduate students. On Monday, June 12 our first batch of TERFers arrived! After introductions and going through the “Guide to Being a TERFer”, they spent the morning getting acquainted with the many research sites spread across Tyson’s 2000 acres. Each of the TERFers will spend 4 weeks working with one specific research team, but we always want to make sure they get exposure to as many different projects as possible. The Tour de Tyson Challenge let the students brush up on their map reading skills and become more familiar with the layout and history of Tyson Research Center. Hidden at each location was a clue to help them get to the next spot. While seeing some of the sites where they will be working this month, the TERFers had to collaborate as a team using effective communication to find all the locations on their own. The last stop on the tour provided a welcome break from the summer heat. The cool quarry cave is a favorite place for our research teams to visit as a reward for hard work. And we were lucky to see some cave salamanders wriggling away from us! Once they navigated back to Tyson Headquarters, the TERFers joined their undergraduate teammates for lunch on the deck. Every TERFer had been to Tyson several times last summer as a participant in the Shaw Institute for Field Training (SIFT) program, so it was familiar territory and each of them fit right in. After lunch the TERFers were whisked away by their team leaders for new scientific adventures on the Tyson teams - the Forest Biodiversity Team, the Natural Enemies, the Clover Cyanide Bombers, and Team Tick-quito. Tyson undergraduate fellow Aspen Workman (left) explains how rain water captured from the roof is used to water prairie plant experiments in the Tyson research garden. Aspen was a participant in the SIFT and TERF programs during high school and now plans for a career in ecological research.